Our water damage Canton experts with 911 Restoration Jackson are available to assist homeowners 24/7/365. We know situations can arise at any time of the day or night so regardless of what time you need us, we will be there within 45 minutes of your call. When we arrive, we are fully equipped to face any situation. So if your home is facing the threat of a leak, call our water damage Canton and mold removal Canton experts for a free inspection and long-term solutions. When our water damage Canton and mold removal Canton expert arrive at your home, they arrive with answers, equipment, and solutions. The first thing they do is conduct a free visual inspection of the inside of your home. Once they assess the level of damage, the water damage Canton pros draft a detailed repair estimate and go through the restoration process. We want our customers to feel comfortable knowing that experienced pros are repairing and restoring their home even better than its original condition. Once you decide to work with us, our damage Canton pros rely on their skills and powerful water mitigation machines that extract every inch of standing water. 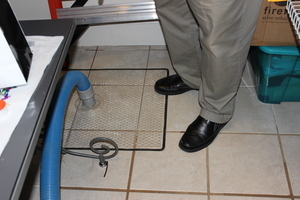 Then with high-powered air movers and dehumidifiers, every affected area is completely and thoroughly cleaned and dried. Lastly, our mold removal Canton experts use infrared cameras to pinpoint hidden moisture spots in wall cavities, so we are absolutely certain that we have not missed an area; even those hard to see areas such as under your floors. Contact the water damage Canton and mold removal Canton experts with 911 Restoration Jackson to schedule your same day service appointment. Our water damage and mold removal Canton staff members understand the situation you are facing in your home can be an overwhelming thing. So, we do what we can to address all of your concerns and provide you with peace of mind. Every homeowner is paired with an experienced project manager from our local office. From providing the most affordable prices to offering to file your claim for you, we will work with your insurance company so that you get the most coverage out of your homeowner’s policy. We provide top of the line and quality repairs so you and your family can live comfortably and safely. If you are seeking immediate assistance and solutions to the water damage or mold growth in your home, call the water damage Canton and mold removal Canton experts with 911 Restoration Jackson.